This is the way to go if you like making your own birdhouse. We do the drilling and cleaning and you do the finishing. 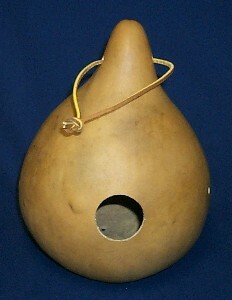 This is a 7″ to 8″ gourd that has been drilled with a 1-1/2″ entrance hole, ventilation holes and hanging holes. The entrance hole may easily be enlarged with some coarse sanding paper or a jigsaw. They are cleaned and ready for your finishing touches. Paint them, dye them, or just spray a coat of urethane on them for that great natural look. LEATHER HANGING STRIP INCLUDED.